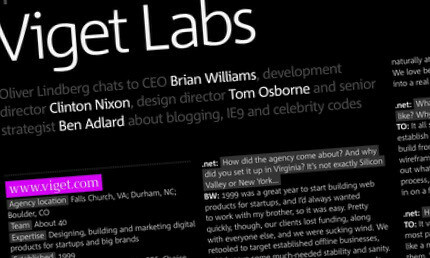 We're big fans of .net magazine here at Viget, and we're looking forward to their new site launching soon. So, we were flattered when associate editor Oliver Lindberg asked if we'd be up for a little Q&A a couple months back. We heard this week that our profile is featured on pages 76 & 77 of the January 2011 issue on newsstands now ... but only in the UK. Along with our fellow Americans, we'll have to wait until early next year to experience the glossy print on our fingertips. For now, we've included a low-res preview. Tom, Clinton, Ben, and I did our best to answer Oliver's questions, which included gems like why we're in DC, how we deal with tight budgets, what we thought of Ryan's anti-UX post, and our most bizarre client request ever. 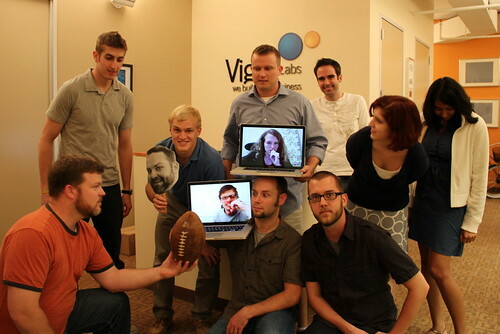 It was fun to have Peyton and Emily join virtually from Durham, and it's always nice to have Tom's head on a stick. If you're in the UK, pick up a copy -- and send us one so we don’t have to wait 2 months to see it in print! Update: the entire article is now available here.